Pets: Maximum two pets per registered unit. All pets must be kept on a leash or in a pen at all times. Excessive barking will not be tolerated. Owners are required to clean after you pet immediately, anywhere on the property. Please carry a disposal bag (available at the office) when walking your pet. Pets are not allowed to interfere with other people’s enjoyment of the campground; vicious dogs will not be allowed to stay. 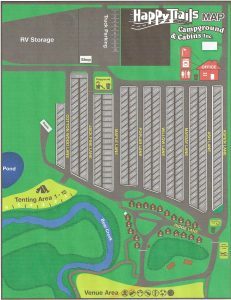 Check-In & Check-Out: RV check-in is 3:00 PM, check-out at 11:00 AM. Garbage: Please dispose of your normal household garbage (no appliances, propane tanks, etc.) in the dumpster located at the RV park. Please do not use fire rings as garbage bins. Recycling bins for bottles, cans and cardboard are located behind the General Store. Sewer Hook-Up: RVs must use a 90 degree elbow to prevent odours. All grey and black water must be discharged in the septic system. Please inquire with management at 780-814-6919 for group rates.